ATLANTA – QJS Design Studio recently tabled their reuniting in partnership and rebranding initiative with New York based publication, Athens: New Renaissance Magazine. The creative firm, QJS, is a visual design team that exercises more than just their graphic work. For this project, the firm has spearheaded a new activation to embed Athens’ distinct publishing work into New York houses through the magazine’s custom designed typography, layout and logo. The QJS team began working with Athens in the beginning of 2012. Their first publication released together featured Hip Hop artists Joey Badass and Pro Era, as well as, latest indie sensation Allan Kingdom. The team’s visual strategy has led the publication to a widened readership of 500,000. Since then, Athens has advanced in itself leading them to partnerships with brands like Urban Outfitter’s, athletic company Without Walls, and more. For the latest rebranding of the publication, Athens’ 6th issue with the QJS team introduced the publication’s signature typeface. Dubbed “Athens Sans”, it’s combined with traditional typefaces Benton Sans and Minion Pro, giving the publication it’s own fun yet functional and traditional familiarity. QJS Design Studio’s team is an agency of record – which means the firm’s responsible for creating all of Athens’ communicative artwork. Outside of developing surface visuals for clients, they work to engage them as partners and study the brand’s essential qualities; therefore, developing a richer detail to the intrinsic pieces. The design firm has worked with various companies like Atlanta’s Big Kidz Foundation helping the organization gain over $1 million dollars, as well as, University Courtyard’s campaign, which increased their leasing by 36%. Their direct project with Athens is anticipated to release at the end of September, with a full publication release and new online website. The issues will run both physically and digitally. 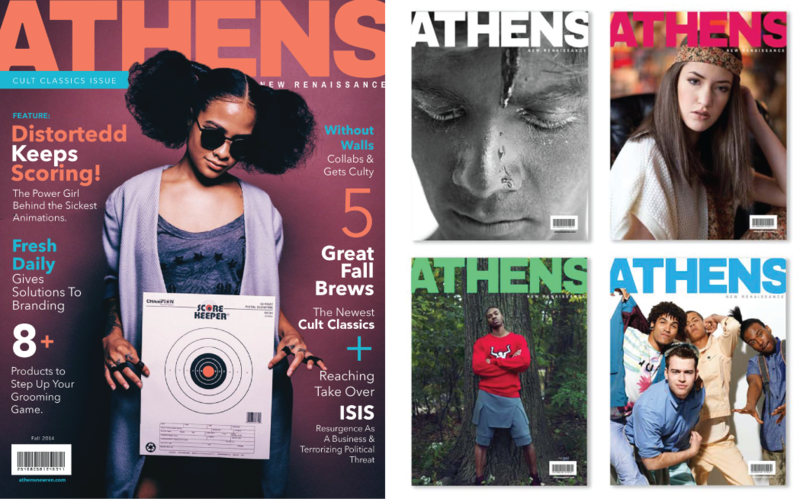 About Athens: New Renaissance Magazine – Athens: New Renaissance Magazine is a medium used to promote striving artists within the young community. Athens believes in keeping alive the source of print communication through its print publication. Athens focuses on those the underground/upcoming artist who produces everything with the ambition to strive for their passions. Athens is a quarterly magazine with its first issue released in early 2012.